Finally had the opportunity to check out Birra this evening with my dining companion Janeane from Philly-ism.com. We enjoyed the Meatball Al Forno beef & veal in gravy, parmigiano reggiano, and fresh herbs. They were outstanding. If you like large, classic Italian meatballs you won’t be disappointed. I thought I took a picture, but sadly it did not take. Then, simply because I had seen raving reviews, we got the Pizza Alla Carbonara. 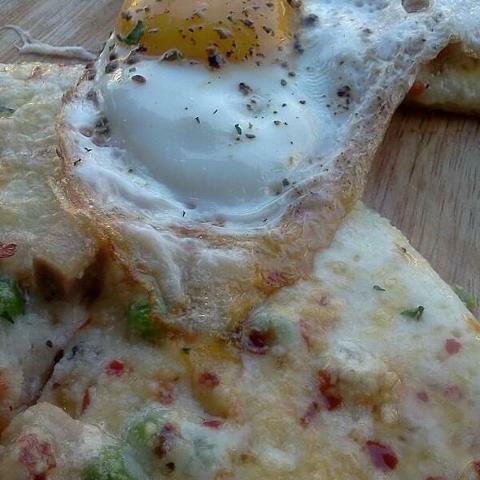 White pizza with house cured pancetta, peas, mozzarella, pecorino, black pepper, and fried egg on top. I took a terrible picture. It doesn’t do it justice. The raves were on. Nothing but pure, unadulterated deliciousness here. They delivered a perfectly handmade pizza packed with flavor. It was rich and intense, but nothing that I couldn’t handle. And that fried egg? Trust me, it worked! It was a bit too much food for the two of us. Can you say food baby? Yowza! The beer menu looked great, but I am soooo glad I had some wine instead. Anything heavier would have put me over the top. Tags: Birra. Bookmark the permalink.